Back row, from left: Yoshi Ishii, Japanese Category runner-up; Ronan Takagi, English Category runner-up; Kai Horikoshi, Japanese Category runner-up. Front row, from left: Madeline Parga, Youth Category runner-up; Jamie Han, Youth Category co-winner; Elizabeth Farris (on computer screen), English Category winner; Masafumi Mori, Japanese Category winner; Akira Tsurukame, Japanese Category runner-up. 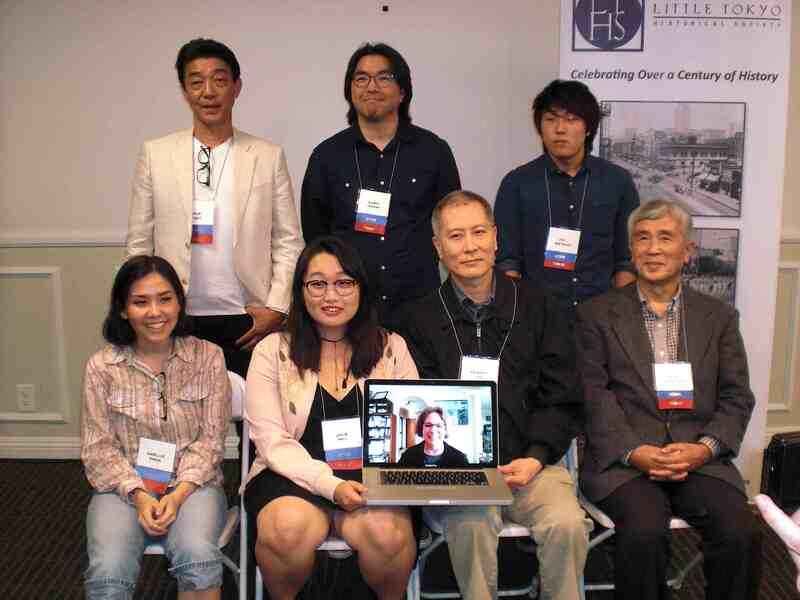 The winners of the fourth annual Imagine Little Tokyo Short Story Contest were announced at an awards reception held April 20 at the Japanese American Cultural and Community Center’s Garden Room. The contest is sponsored by the Little Tokyo Historical Society. Mike Okamura, LTHS president, gave opening remarks and Bill Watanabe, Short Story Contest Committee chair, served as emcee and gave closing remarks. “Two of the short stories this year had strong themes of Japanese cultural art forms — the Japanese-language story revolved around the art of making sushi and how sushi has evolved in recent years with the California roll and other kinds of ingredients,” Watanabe said. “And the English-language winning story used ikebana as a means to tell the story about the relationship between a young girl and her grandmother. The Youth Category winning story involved ghosts who visited a young man in Little Tokyo with a message of life and death. Dramatic readings of the winning stories were done by Keiko Kawashima, Alison Minami and Kyoko Okazaki. Submissions must be original and previously unpublished, and must be set in Little Tokyo — past, present or future. Stories have been received from local writers as well as from other states and other countries. The writers’ names are concealed during judging. The winner in the English Category, announced by novelist Jon Shirota (“Lucky Come Hawaii”), one of the judges, was Elizabeth Farris for “Unspoken.” Like the last two winners in this category, Farris — who also lives in Arizona — was unable to attend but participated in the program via Skype. The story was read by actress Keiko Kawashima. “Unspoken” includes flashbacks of the grandmother’s efforts to maintain the practice of ikebana while incarcerated with her family at Manzanar. The other finalists were Ann Malaspina for “A Scarf for Akiko” and Ronan Takagi for “Ake Ome.” A total of 32 stories were submitted. The other judges were Momoko Iko and Valerie Matsumoto. The winner in the Japanese Category was Masafumi Mori of Studio City for “Makisu no Kamisama” (The God of Sushi Mats). He was introduced by Shige Higashi of Cultural News and the story was read by actress Kyoko Okazaki. Tiffany Tanaka of the contest committee provided a written English translation. The story is a Japanese version of “It’s a Wonderful Life” in which a Little Tokyo sushi chef — inventor of the Triple T Roll — visits an alternate reality in which roll sushi never became popular in America. The other finalists were Kai Horikoshi for “Nakajima-san,” Yoshi Ishii for “Oshogatsu in Little Tokyo Story,” and Akira Tsurukame for “Jichan no I Love You.” A total of eight stories were submitted. The other judges in the category were Toshio Handa, Tomomi Kanemaru and Kohki Watabe. The winners were introduced by judges Shige Higashi (Japanese), Jon Shirota (English) and Jim Sherod (Youth). The winners in the Youth Category, announced by one of the judges, Jim Sherod of the Little Tokyo Public Library, were Madeleine Chou and Jamie Han of Irvine for “To Walk the Path of Memories.” Chou was unable to attend. This marked the first time that two writers have won for one submission. The story was read by actress Alison Minami, a member of the contest committee. The protagonist of this story is shocked to discover that he has passed on and must prepare for the afterlife, leaving behind his young daughter. The other finalists were Madeline Parga for “Jane in the Parade” and Lois Ramilo for “Her Little Tokyo.” A total of eight stories were submitted. The other judges were Sara Hutter and Sarena Kuhn. Short Story Contest Committee members included Jan Fukuhara, Naomi Hirahara, Miya Iwataki, Emiko Mita, Eijiro Ozaki, Sindy Saito, Sunny Seki, Nancy Uyemura and Jayson Yamaguchi. The winning stories will be printed in The Rafu Shimpo and all of the finalists’ stories will be posted on the Japanese American National Museum’s Discover Nikkei website (www.discovernikkei.org) and the LTHS website (www.littletokyohs.org). Donors and supporters of the contest include Cindy Abrams (in memory of Hiro Hishiki), Bunkado, Sansei Legacy, San Fernando Valley JACL, Toshi Sushi, Mr. Ramen, Fugetsu-Do, and JACCC.